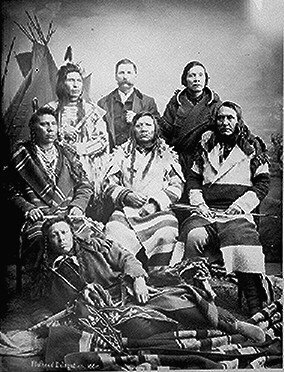 It was in the autumn of 1832, in the regions of the far West, by the waters of the Columbian River, that a traveler was led by commerce to seek out the tribe of Indians dwelling upon its borders (commonly called the ‘Flathead Indians’). He appeared at the entrance of a wigwam and asked for food and water, in broken accents, but in their own language. When the traveler was rested and refreshed, the wigwam owner asked his errand, and when he said he was there with items to trade, that made him very welcome to these children of the wilderness. The Indian turned into his hut to sleep, but he could not sleep at all. When the storm was hushed, he walked out again into the clear, still moonlight to think about the book which could teach people the way into the sky. The next morning he repeated what the traveler had said to two men in his tribe, and he asked them if they would go with him to fetch such a book from beyond the mountains. They agreed, and after a season when the traveler went on his way, they too took their journey in an opposite direction. They lived by the chase, endured innumerable perils, and were six months on the road;– but at last they arrived at their destination, and entreated to see the book of which they had heard, and to be taught that which they did not know. Their story excited great interest. They were welcomed and instructed. But after many months had passed, the Indian who had first heard the good news from the traveler, worn out with the fatigue and hardships of his journey, fell ill and died. But this was not, however, before he had listened to the glad tidings of salvation by Jesus Christ, and declared that he believed the book. A missionary offered himself to return with the two others to their homes, and did accompany them back to the Columbian River. Accounts were received from him of his safe arrival, his joyful reception by the tribe, and of his beginning to distribute among them the water of life. Psalm 61:1-2 — Hear my cry, O God; listen to my prayer. From the ends of the earth I call to you, I call as my heart grows faint; lead me to the rock that is higher than I.